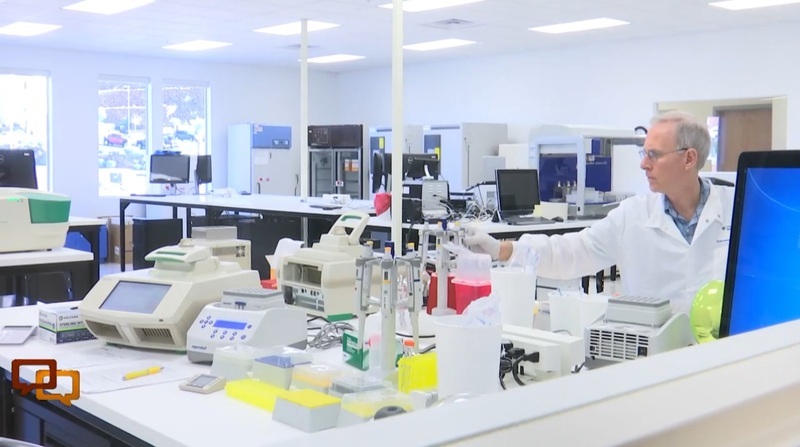 ST. GEORGE – A milestone in cancer treatment and research was marked Tuesday by a ribbon-cutting and open house to celebrate the new Precision Genomics Laboratory in St. George. Doctors, donors and patients gathered to hear the story of its creation and tour the facility. The team of Dr. Lincoln Nadauld, Dr. Derrick Haslem, Dr. Pravin Mishra and others are changing the way serious cancers are treated by sequencing a patient’s DNA in search of genetic mutations known to cause cancer. “There are other places in the country where sequencing is occurring, even at major cancer centers, but there is no place in the country that sequences to the level on the gene that Dixie Regional Medical Center Intermountain Healthcare does,” Kane said during the ceremony. Kane told the crowd the lab is able to examine genes at a deeper level, allowing scientists to identify more mutations than other labs. Applying the cutting-edge science to the most serious cancer cases is a mission for Dr. Pravin Mishra, director of the lab. The open house served as a thank you to the charities and individuals who contributed to the lab and its high-tech equipment. “We just want to thank the community, the St. George community, because they have, in their Jubilee of Trees, shown us their grace,” Mishra said. JJ DeForest is an experienced reporter focused on issues affecting Southern Utah. She brings a broad range of experience to St. George News including print, broadcast and multi-media reporting. It is great to have such excellent medical facilities in this relatively small area, particularly when I look back to what we had in the ’80’s here. Sure there are a lot of things about growth that are irritating. But growth is going to happen no matter what, so I’m just thankful that our services and retail are growing along with the population. Driving to SLC or Vegas for medical or shopping was just a royal PITA.